With perhaps watercolor just barely beating it out, acrylic painting is typically the medium of choice among beginners. It’s not terribly complex (unless you make it so), performs incredibly well on most surfaces, and has a much more welcoming price tag when compared to other mediums such as oil. Of course, we went over a full comparison between oil versus acrylic in this article, but today we wanted to take a slightly different direction…. Instead of talking in a hypothetical sense about different mediums, we wanted to talk about the essential acrylic painting materials you should have on hand in your studio. While many materials in the art world can become a bit excessive, after all who REALLY needs to have art swabs on hand – can’t we just use a simple q-tip?!? Today we are going to share some of the staple acrylic painting materials that you will actually find yourself using nearly every time you go to make your next piece. These materials are critical in every step of the art journey. Whether you are a beginner looking to try acrylic paint for the very first time, or perhaps you are a self-taught artist looking to hone their craft, there is going to be some materials that will make you go ‘a ha’ the next time you apply them in your piece. Now of course no list of acrylic painting materials would be complete without paint on it, right?! 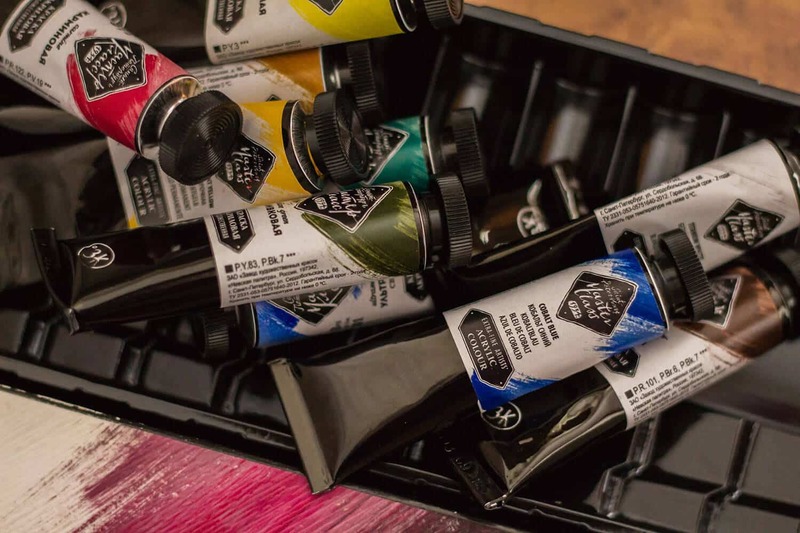 Unless you plan on selling your work or having it on display at a local gallery, for casual or hobby level painting, we would strongly urge you to go with student grade paints. While not commanding the steep price found in the artist or professional level paint, student level will still achieve desirable results. 99% of paintings you see aren’t about the materials used to make them, but rather the technique and skill level of the artist yourself. While we would all like to channel our inner Van Gogh, when starting out, there is no reason to excessively waste your budget on expensive materials. 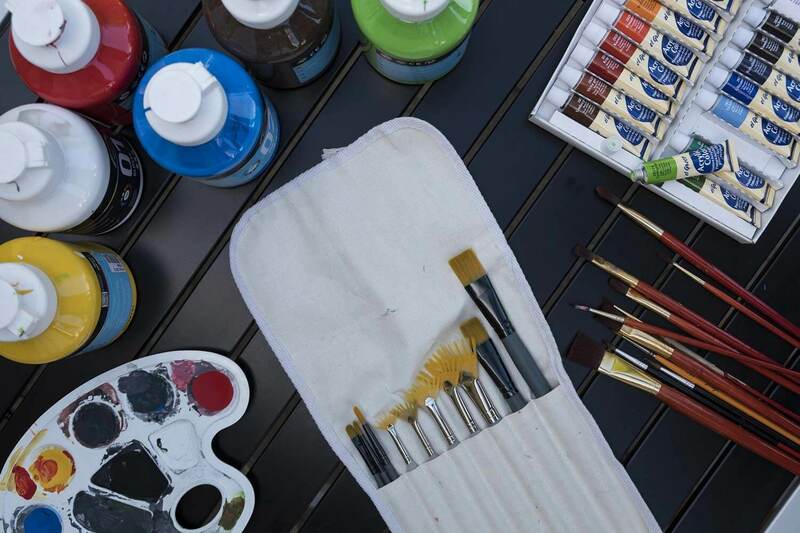 Now this isn’t to say you can’t ever buy nicer acrylic paints, you absolutely can (and should), we are simply recommending that go with the student level products while you still are learning how to unlock your potential. Golden Acrylic Introductory Set – This 6 piece acrylic set is perfect for beginners. At an affordable price, you can get really amazing results with this respected brand. Winsor & Newton 12 Piece Set – Perfect for intermediate level painters. Can easily upgrade to large tubes as you use. Also makes for a terrific gift set. The biggest gripe that many acrylic artists have with this medium is its fast drying times. When compared to other mediums like oil that may take days or a week to fully dry, acrylic is typically touch dry within about 30 minutes. This incredibly fast drying time can wreak havoc on your brushes. 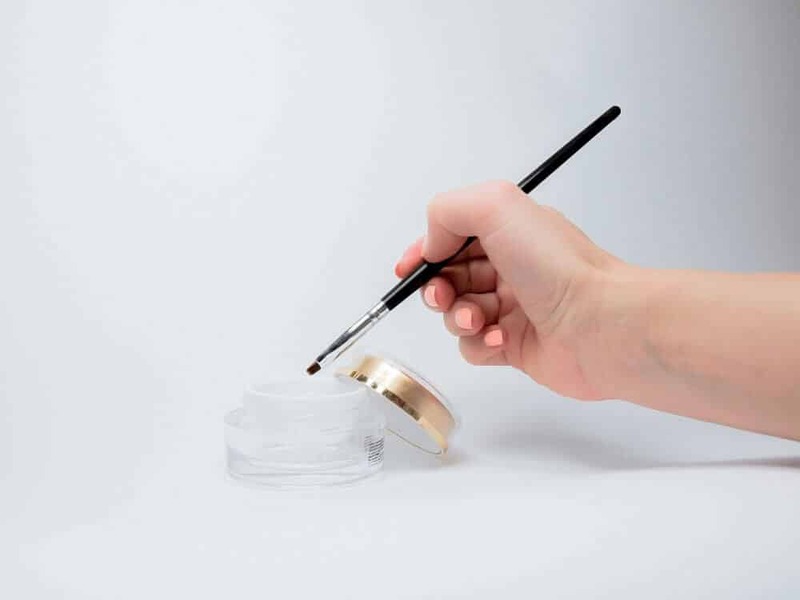 As we talked about at great length in this article, trying to remove acrylic paint from your brushes is a rescue mission. While quality brushes can produce amazing results (i.e. see Kolinsky Sable brushes), their equally high price tag is reserved for artists who not only have ample budget, but know how to care for them properly. Therefore, when starting out, the reality is that you will likely burn through a few brushes due to misuse (we’ve all been there). So, starter sets are perfect for beginners still getting a handle on this temperamental medium. This will not only save your budget, but also not break your heart when your favorite round or flat bristle brush needs to go in the trash. Blick Academic Set – Designed for students, this pack comes in either a large or small set. The synthetic bristles should complement your acrylics extraordinarily well. Stanislaus Brush Set – 12 brushes for under $12 is a real bargain when it comes to starter sets. While not a brush likely used by professionals, its perfect for understanding the fundamental techniques for painting. You don’t have to go far in Google search results to find countless tutorials on artists attempting to remove hardened acrylic from their carpet or clothes. As we mentioned just a minute ago, this stuff dries quickly! Therefore, to keep your surroundings clean when you aren’t painting, be sure to set down a drop cloth or old blanket onto the ground prior to painting. While many artists typically don’t fling paint around in their studio (with Jackson Pollock being an exception), you never know when a distraction may occur and a simple slip of the wrist could spell disaster for your carpet. While you could use newspapers to save the ground as well, unless you want to hear the crunching sound every time you make the slightest of movements, opt for a blanket instead (plus it will be comfy on your feet when standing J)! One of the beautiful things about acrylic paint is its ability to adhere to just about anything. Whether you are using acrylic paint on glass, metal, plastic, wood, cardboard, or any other non-traditional surface, the options are truly endless with this medium. But whatever surface you decide to paint on, nearly in all cases you will want to have gesso available at your disposal. 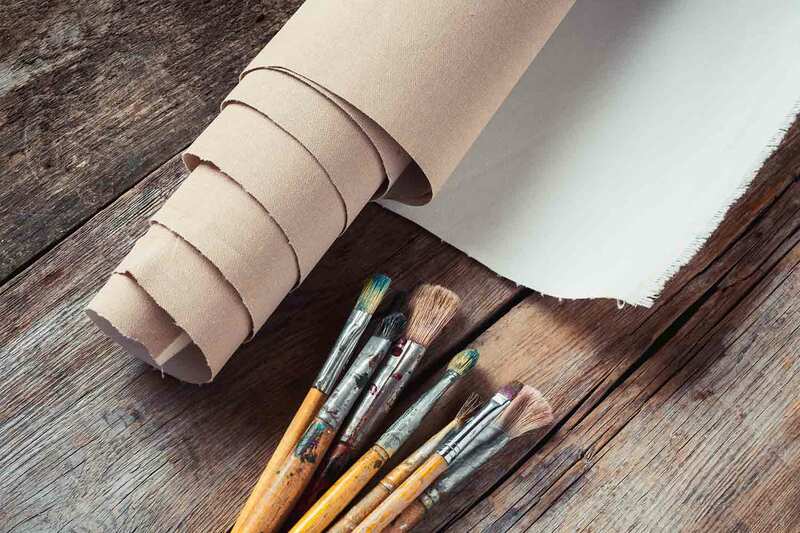 Also derived from acrylic, gesso acts as a primer that can adhere to any surface acrylic may stick and will give it plenty of texture and absorbency qualities. Typically coming in the color white, you can also find both clear and black gessos – which allow the original surface texture to shine through while still giving you a thin layer of gesso to work with. For beginners however, we would recommend traditional primed canvas. Specifically, we would go with panels over stretched canvas as this is a much cheaper option (~$0.70 per panel) and allows you to really practice painting techniques without breaking the bank. Blick Canvas Panel Classroom Pack – Economy canvas panels that have been pre-primed for acrylics. Excellent choice for beginners looking to explore a new medium like acrylic. When painting with acrylics, it’s important to make sure that you mix your paints on a palette prior to applying to the canvas. While you may see palettes like this one that have wells, we would conversely recommend an alternatively. Specifically, we would recommend that you go with a completely flat surface such as glass to mix your medium. A completely flat surface will allow you to use palette knives instead of brushes for the mixing to attain much more consistent colors. Plus, with a glass palette you can reuse it for every painting by simply scraping it clean with a flat razor. Glass Palette – Loved by artists of several different mediums, this palette will allow for easy and smooth mixing of your acrylic paints. 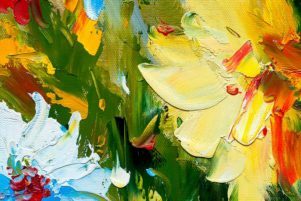 Palette Knives – Whether you apply the paint directly on the canvas or used just to mix your medium, never underestimate the utility of a palette knife. When using acrylics, your reliance on harsh solvents like odorless mineral spirits or turpentine simply aren’t necessary. 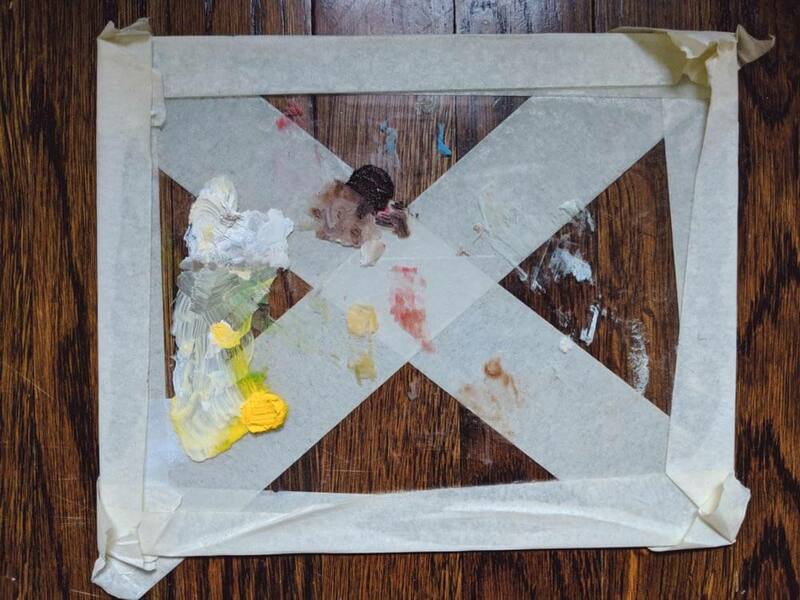 Therefore, when cleaning incidental messes or simply trying to reverse an error on your painting, we would recommend having copious amounts of cloth rags on hand. Whether you use an old undershirt, cloth diapers, or specific artist grade rags, the high absorbency of a natural fabric will be much better than wasting paper towels. Microfiber Cleaning Cloth – Get high absorbency materials in half the space. Extremely useful and able to be used outside the studio as well. 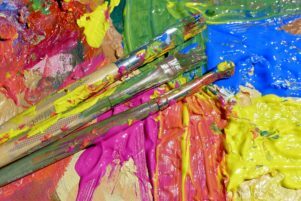 For painting in general, a dirty brush can really dull or muddy a naturally vibrant pigment found in most acrylics. Given that water is the natural solvent for acrylic paint, we always recommend to beginners that you employ what’s called the double bath system. This way you get expected results time and time again. 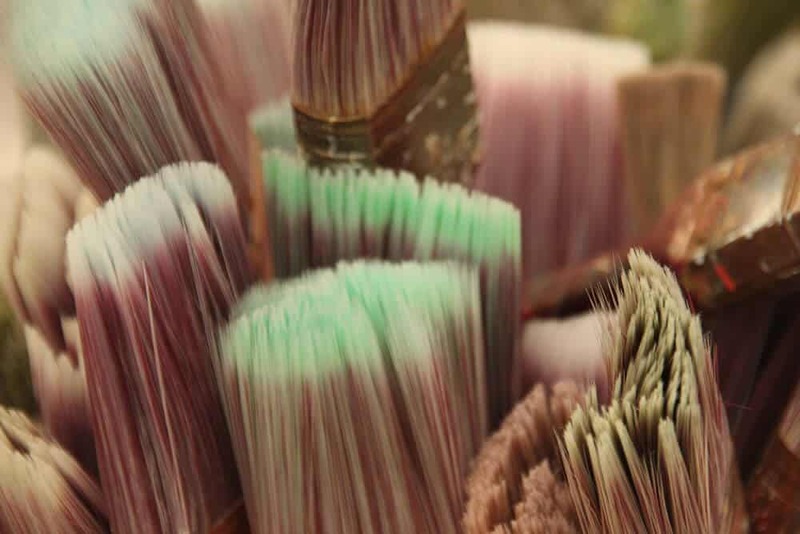 Furthermore, we would also recommend getting in the habit of washing your brushes regularly while painting. Not only will this prolong the life of the brushes themselves by ensuring no acrylic dries around the base of the bristles, but also gives you a couple of minutes to re-evaluate your painting. While you can find many artists painting on a completely flat surface, we still recommend that you paint on an easel. Not only will this ensure that you don’t incidentally skew your perspective while painting, but it will also be much more comfortable. Whether you prefer standing or sitting, you can find an easel to match your style. Table top easels, as you may have guessed, are perfect if you plan on sitting down throughout the entire painting process. A frame easels will be preferred by most artists as they not only have a sturdy base, but will also be able to fit the majority of surface sizes for beginner and intermediate artists. The collapsible design of A frame easels is also great for artists who don’t have a full studio at their disposal. Lastly, portable easels are great for artists who like the standup design of the A frame easel but want to occasionally paint en plein air (outdoors). These portable easels are also perfect for artists living in large metropolitan areas where excess space might be hard to come by. American Easel A Frame – A solid conservatively priced easel that should last you several years. With its full wooden frame, don’t expect much movement of the legs while painting. Ohuhu Field Easel – Weighing in just under a couple of pounds, this easel is perfect for any artist old or young to be able to carry on long hikes and set up an outdoor studio. A piece of work will undergo many different layers when its being made. While the wash, underpainting, and over painting all hold important aspects to a painting, quite possibly the most important layer will be the underdrawing as it sets the overall composition. 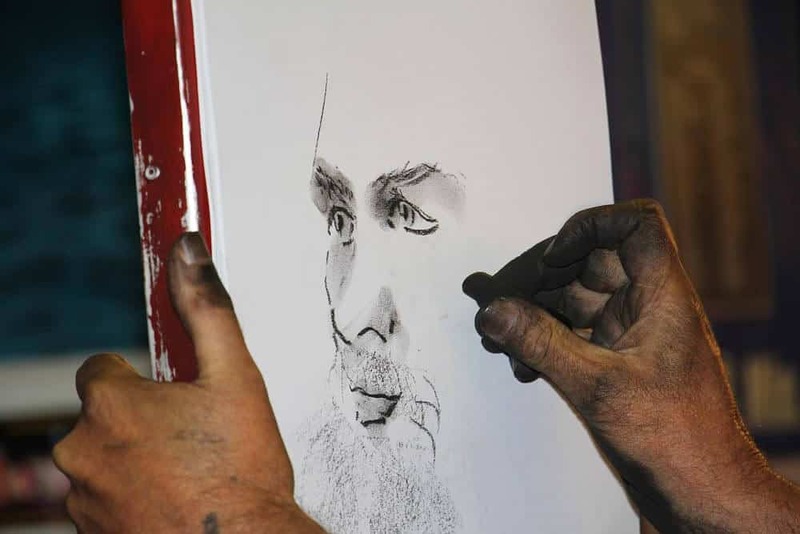 Given the permanent and opaque nature of acrylic, many artists will always begin with an initial sketch of their subject before laying down their initial wash. When painting with acrylic, most artists will either use charcoal or graphite. 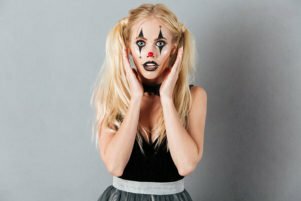 While both mediums have their own set of advantages and disadvantages, they are an essential part of the art creation process. However, should you decide on charcoal, we would recommend also using a fixative once you are done. Fixatives will ensure that the charcoal stays on the surface itself and doesn’t lift and mix with your paint (which may darken its color). Like linseed oil for oil paints, flow improvers such as this one by Winsor & Newton will help to not only make the acrylic glide more easily on the surface, but also to make the paint last much longer than if you were to use it directly from the tube. 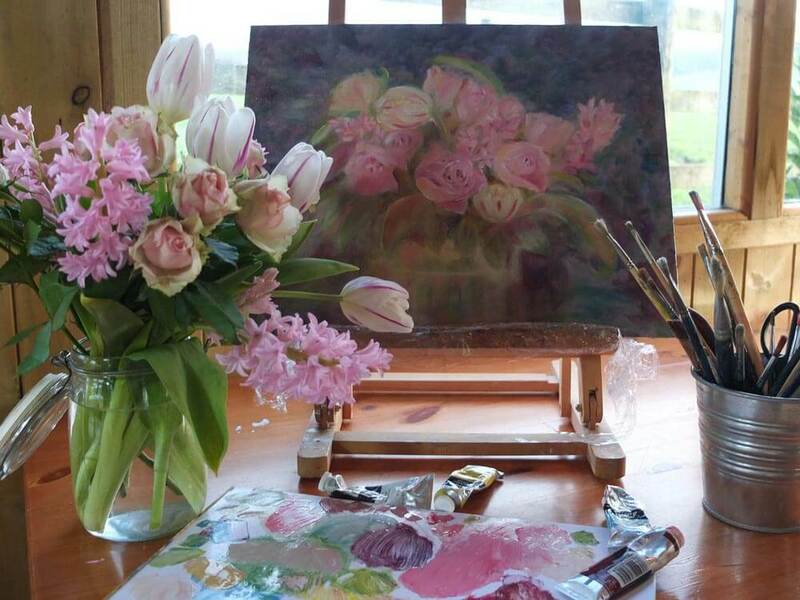 Secondly, flow improvers can also counteract the quick drying times that you typically experience in acrylic paints – this means that you can paint in a much more measured pace instead of ever feeling rushed. While perhaps not as critical for small scale pieces, should you decide to take on a medium or large scale piece, you will want to make sure that you have a flow improver on hand. Varnishes for acrylics come in many different varieties. Whether you are looking to achieve a matte finish or a full gloss (or somewhere in between) a varnish will help to really make your painting stand out. While perhaps not nearly as important for artists who are exploring acrylics for the very first time, if you plan on presenting your pieces at a local coffee shop or gallery, a varnish can be a great way to really draw attention to your piece. In the world of artistry and always pushing the bounds, exploring new products like varnishes can really help you learn as an artist. Liquitex Varnish – One of the most popular acrylic varnishes today, this stuff is not only affordable, but will make your painting look way better. In this day and age of instant gratification and social media envy, it’s important to remember that making beautiful paintings takes both time and experience. 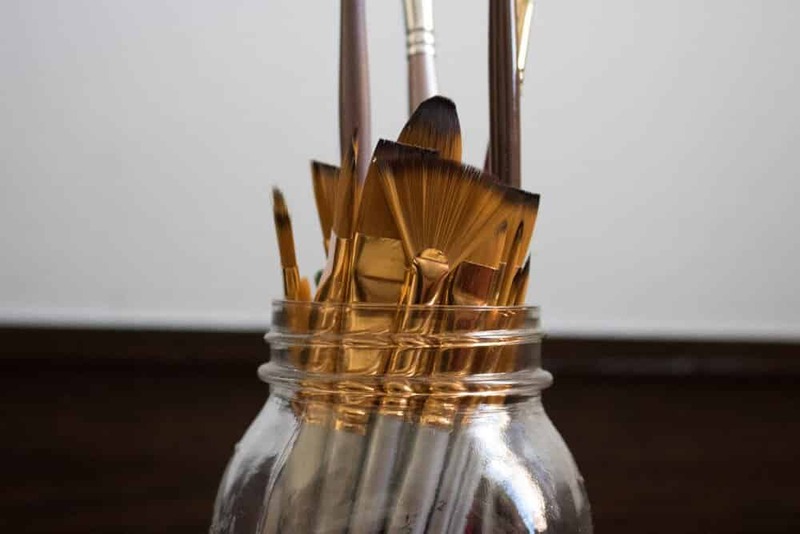 While all the acrylic painting materials can make a measured difference in the final piece, it’s really who is on the end of the brush that matters. 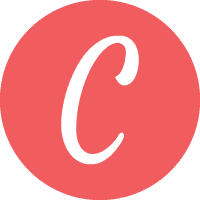 Regularly practicing your work and making it a habit will see exponential results. So be sure to always step back and critique your work, keep on challenging yourself, and most of all, enjoy the process!